Moving up a cabin class is a privilege that makes flying more comfortable and enjoyable. There are several ways to request an upgrade, depending on your Airpoints status. OneUp™ upgrades and offers for Economy Skycouch™ must be requested at least three days prior to travel. 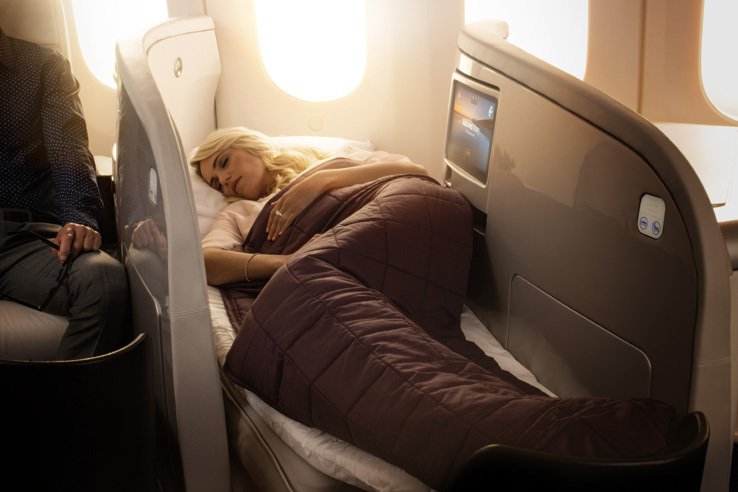 You can request a cabin class upgrade or Economy Skycouch when you’re booked on an Air New Zealand ticketed and operated international flight. Just decide how much you’re willing to pay for the upgrade or for Economy Skycouch and send us your best offer along with your payment details – Airpoints Dollars™, credit card or debit card. Offers made by our Silver, Gold or Elite Airpoints™ members will have their offer increased with our compliments depending on their tier level. More about OneUp and Economy Skycouch. A recognition upgrade lets you request an upgrade of one cabin class (for example, Premium Economy to Business Premier™) for one sector of your journey. Two recognition upgrades may be used together to apply for an upgrade to move from Economy to Business Premier. Confirmation of these requests are prioritised based on membership tier and these upgrades are able to be reviewed in tier order for any remaining unsold seats at the airport on the day of travel. More about recognition upgrades. Elite members receive one short haul recognition upgrade every Elite membership year, which may be confirmed up to 355 days prior to your scheduled flight if upgrade classes are available. These upgrades are able to be reviewed for any remaining unsold seats at the airport on the day of travel. More about Elite short haul upgrades. This type of upgrade is exclusively available to our Elite members. If you are an Elite member it will enable you to request a one cabin class upgrade using Airpoints DollarsTM at a fixed rate. For example, an upgrade from Economy to Premium Economy or Premium Economy to Business Premier. Elite Airpoints Dollar Upgrades should be made at the time of booking or as early as possible, as with recognition upgrades this type of upgrade request may be confirmed up to 355 days prior to your scheduled flight if upgrade classes are available. These upgrades are able to be reviewed for any remaining unsold seats at the airport on the day of travel. If an Elite Airpoints Dollar upgrade isn’t successful, the Airpoints Dollars will be refunded. Elite Airpoints Dollar upgrades are only available on Air New Zealand operated and ticketed flights. See the Elite Airpoints Dollar upgrade chart. You can use Airpoints Dollars to purchase a Star Alliance upgrade in conjunction with a ticket in an eligible booking class. Star Alliance upgrades are available in limited quantities and can be requested online using the Star Alliance upgrade request form. Star Alliance Upgrades are confirmed at the time of request based on space availability. Upgrades on ANA may only be requested within 28 days of flight departure. Upgrades to First and Business Class on Singapore Airlines' B777-300ER and to Business Class on A340-500 and A380 aircraft are not available. See which Star Alliance booking classes are eligible for upgrade and how many Airpoints Dollars are required for a Star Alliance upgrade. It's important to note that when upgrading with any type of the above upgrades, members will earn Airpoints Dollars and Status Points at the earn rate of the original fare purchased and not the upgraded rate. Upgrades can be requested by using the 'Request an upgrade' button below, or through our contact centre.